This week Chairman Andrew Do called for a Study Session on Homelessness for the Orange County Board of Supervisors. 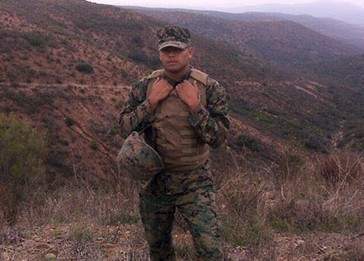 A vacancy on the Orange County Veterans Advisory Committee has been filled by Marine Corp Veteran Mario Munoz, appointed by Supervisor Andrew Do. Munoz will represent the First District of Orange County on the committee. Santa Ana Council Members Michele Martinez and Vince Sarmiento are hosting a joint Campaign Office Kick-Off on Sunday, September 11, 2016 at 414 W. 4th St., in Santa Ana, on Sunday, Sep. 11, 2016, at 10 a.m.
(Westminster, CA) – Orange County Supervisor Andrew Do and the Contractors State License Board are helping Orange County residents fight back against scam artists and identity theft with a free scam prevention seminar. Poll – what should we do about the homeless problem in Santa Ana? What should we do about the homeless in Santa Ana? Santa Ana City Council Member Michele Martinez, who is running for the First District of the Orange County Board of Supervisors, appeared on the John and Ken radio show yesterday afternoon, on AM 640. I don’t think she knew in advance that John and Ken are conservatives – and they only invite politicians onto their show to embarrass them. The interview was hard to listen to as John and Ken yelled at Martinez throughout the interview and barely let her get a word in edgewise. You can hear the interview here. (Santa Ana, California)— As part of its comprehensive response to homelessness, the County of Orange is moving forward with plans to install new bathrooms at the Orange County Civic Center, providing 24-hour access for hundreds of people who are currently homeless. (Santa Ana, California)— Orange County’s transportation agency is investing $20 million to expand and improve the county’s bike trails and pedestrian walkways. The biggest winners: residents of Santa Ana, Westminster and Garden Grove. Santa Ana City Councilwoman Michele Martinez advanced to the November General Election as she made the top two in the Primary Election in the First Supervisorial District, according to the O.C. Voter Registrar. 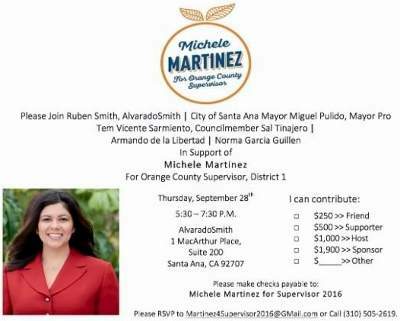 Santa Ana Councilwoman Michele Martinez is launching her campaign for the First Supervisorial District on Wednesday, March 30, 2016, from 5:30 pm – 7:30 pm at The Estate on Second, located at 207 W. Second Street, in Santa Ana. Martinez is challenging the incumbent, Supervisor Andrew Do. He previously served as Chief of Staff to his immediate predecessor in the First District, Janet Nguyen. She has since been elected to the State Senate.